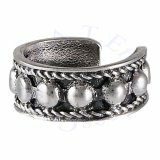 Sterling Silver Nonpiercing Half Balled Ear Band Cuff Wrap. Sold In Single Units Only. Approximately 5mm Wide.